Course Information – Chicago Athlete 20 Miler – Your Marathon Training Run. Pacers available at the start for paces in 30 second intervals from 7:00 minute pace to 13:00+ minute pace. Miles and directions will be marked by arrows and signs on the course. also available on course, and we will have signs directing you how to find them. We will also have turnaround signs for anyone that would like to only complete 18 or 16 miles that day. 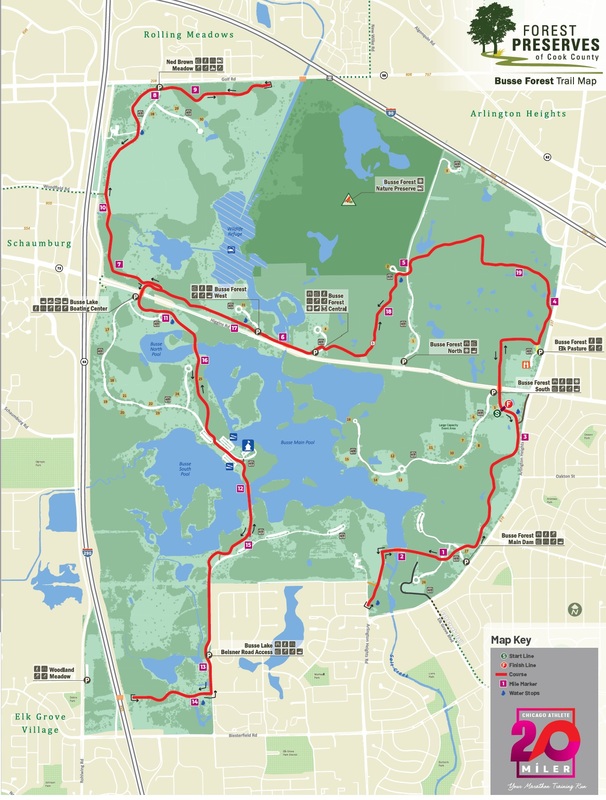 The start/ finish is located in Busse Woods Grove #5. The entrance for this grove is located on Higgins Rd., just west of Arlington Heights Rd. From I-90: Exit Arlington Heights Rd. South. Head south on Arlington Heights Rd. and make a right onto Higgins Rd. Entrance will be about 150 meters down, on the left hand side, just past the bridge. From I-290/ IL-53: Exit Higgins Rd. and head east on Higgins. Continue through the forest preserve. Entrance will be on the right, just before you arrive at Arlington Heights Rd, before you cross under the second bridge. Parking: There is plenty of parking in the grove, but keep in mind it is one, long street. The furthest parking spot is over 3/4 of a mile away, so please plan accordingly.